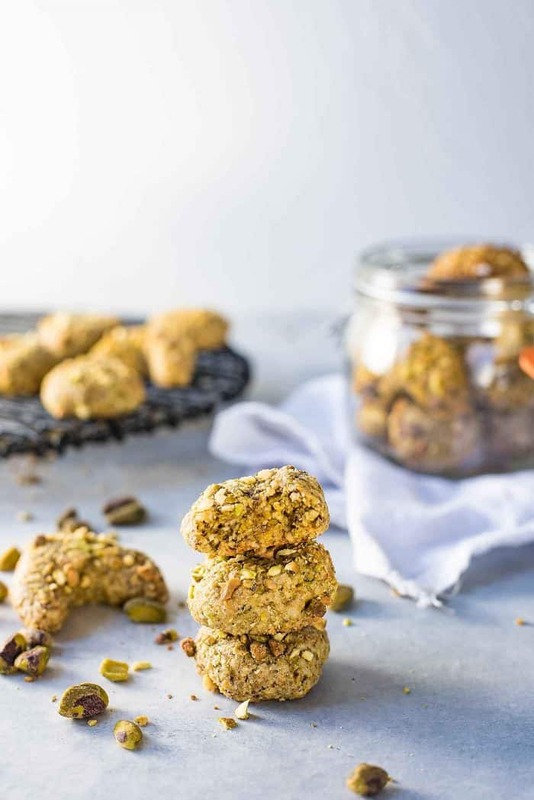 The easiest and most delicious Italian Pistachio Cookies ever! 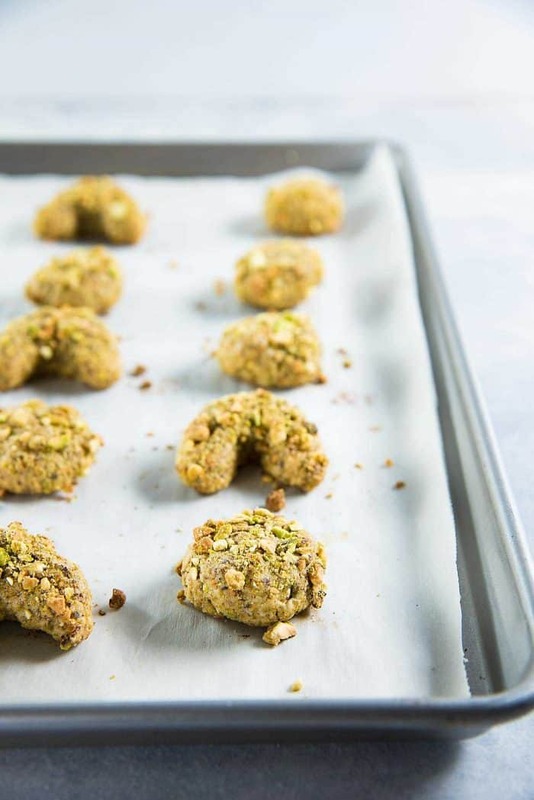 Soft and a little fudgy in the center, with crunchy pistachios on the outside, these cookies are ready in under 30 minutes. Make sure to double the recipe because these babies disappear FAST! I haven’t always been a fan of pistachios. In fact you could say that I used to hate them, which would be much closer to the truth. But now? I can’t get enough of them. So what changed? One fine summer morning (summer in the southern hemisphere) six years ago (almost to the day), I was introduced to a little cookie that blew me away with first impressions. And changed my mind. The meeting was far too brief for my liking, and I never got its name, but the memory of it lingered. Eventually I will return to that meeting place and reacquaint myself with that cookie many times in the following years. And then I moved away and I never heard from it again. And that’s when I decided I will take matters into my own hands and clone it in my kitchen. So I did. The name had always eluded me but that doesn’t really matter. Lets just call these Italian Pistachio Cookies, because something this alluring has got to be European right? All kidding aside, they actually are Italian cookies, as you may find them named elsewhere on the Internet. It was February 2009. My aunt wanted to show me Little Italy in Haberfield, Sydney, where she was going to get herself some Olives and few other deli items. So I went along. She took me to a little Italian bakery (the name of which I cannot remember unfortunately!) along Ramsay street, where I found all kinds of colourful and positively delicious looking Italian sweet treats. I just wanted to get a Rum Baba, but my aunt also got me some Pistachio cookies and Cannolis! And then we went to a place called Pasticceria Papa and got a big piece of their famous Ricotta cheesecake! If those exotic sounding words haven’t already convinced you, let me say it again. Those were little pieces of heaven in my mouth. Those cannolis are still the best I’ve ever had, the Rum Baba tasted amazing, and the cheesecake was the creamiest Ricotta cheesecake I’ve had so far. But the star was undoubtedly (and surprisingly) those soft, slightly fudgy / chewy Italian Pistachio cookies! They had lovely, crunchy pistachios on the outside and a soft center. I could have eaten them all day. 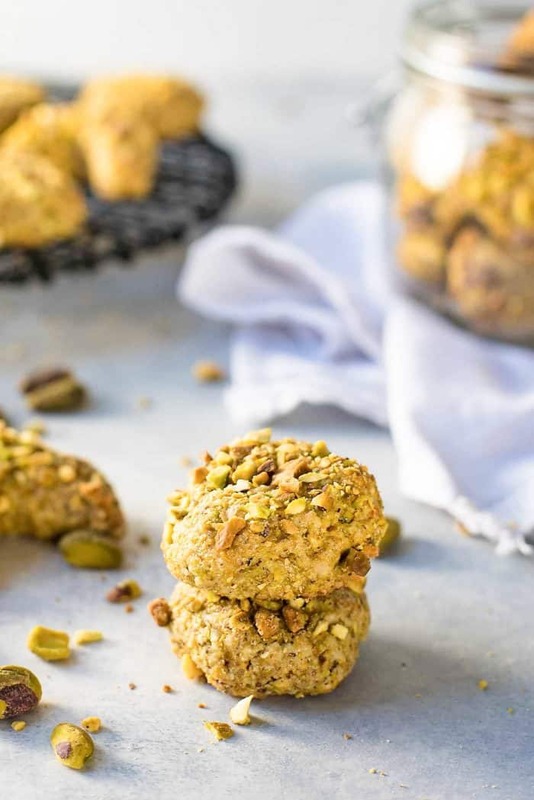 The trick to baking these perfect Italian Pistachio Cookies, is the baking time! You only want to bake these cookies until the bottom of the cookie is just lightly browned. You don’t want the top of the cookie to brown too much (only the edges!) because then these aren’t going to be too soft in the middle. The baking time depends on the shape and size of the cookies. If you make cookies that are about 1 1/2 inches in diameter, then they will need about 15 – 17 minutes in the oven. If you make cookies that are about 1 inch in diameter, they only require 10 – 12 minutes. I like to make crescent shaped cookies as well! When I make these Italian Pistachio Cookies in a crescent shape, I first make a 1 1/2 inch cookie ball and then shape into a crescent shape. These will be ready after baking for about 12 minutes. Because of the shape of these cookies, they take a shorter time to bake than their “ball” counterpart. For this recipe, I made 1 inch round cookies and crescent cookies made with 1 1/2 inch rounds. So that the baking time is the same for both. If you love Pistachios this is the cookie for you. However, even if you’r not a fan, you should still try them! 🙂 Because these cookies are what turned me to the green side! Besides they are so easy to make, why not give them a try? Soft in the center, a little fudgy, not too sweet and dairy- and gluten-free! I always make a double batch, because trust me, they are not going to last very long! So my advice is, make a double batch secretly, and then pretend like you only made one. You won’t be sorry! 🙂 As long as no one discovers your secret stash at least. If they do, you don’t know me and you never read this. Preheat oven to 165°C / 325°F. Line a baking tray with parchment paper. 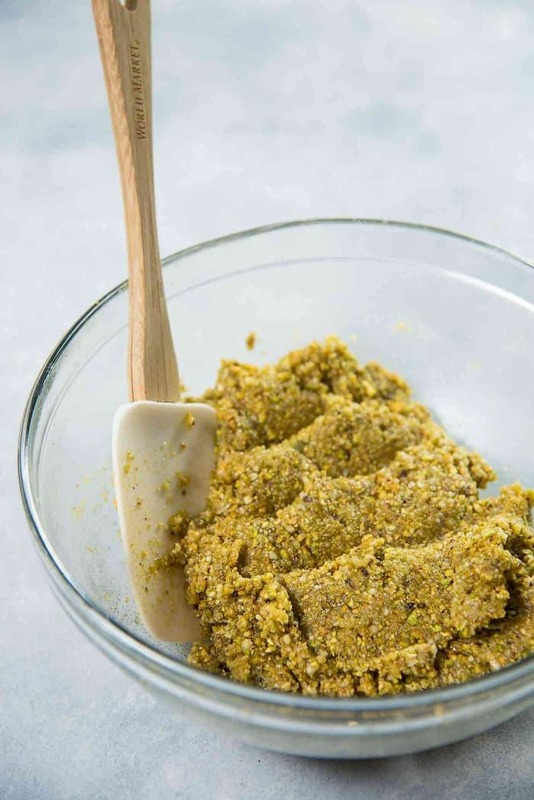 In a food processor, combine the first measure of pistachios, almonds and the sugar. Process until the nuts are ground (with no large chunks left). Transfer the ground nuts and sugar into a clean dry bowl. Mix in the measured egg whites (and vanilla if using, this is optional) with the ground nuts and sugar, and mix with a wooden spoon until you get a slightly sticky ball of dough. You will need to mix well to make sure the dough comes together. If needed, add extra egg whites (1 tsp at a time). Chop the extra 75 g of pistachios into smaller, coarse pieces and set aside. 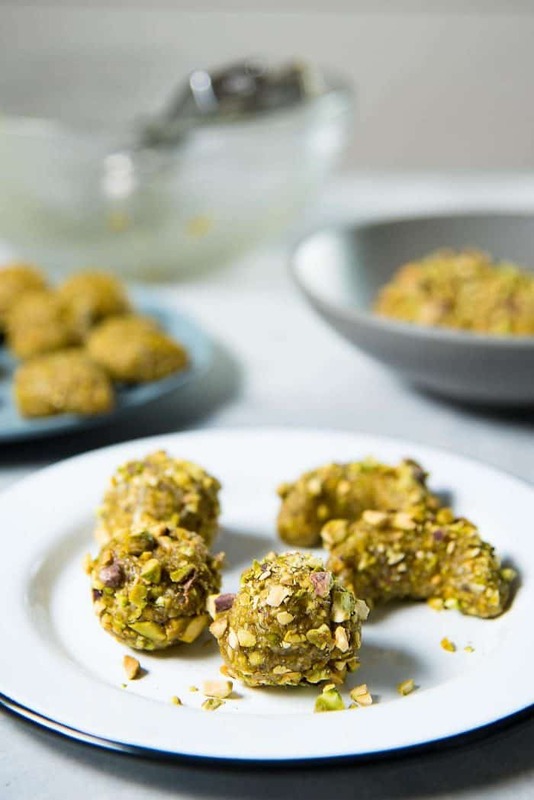 Round cookies - Using a cookie scoop or wet hands, portion out the cookie dough to make round cookies (with a diameter of about 1 inch), and roll each one in the coarsely chopped pistachio nuts. Place these cookies on a prepared cookie baking tray and flatten them slightly. Crescent cookies - Using a cookie scoop or wet hands, portion out the cookie dough (with a diameter of 1.5 inches) to make the crescent cookies. Roll this dough ball into slender cylindrical shape, and then shape it again into a crescent. Dip the top of the cookie in the coarsely chopped pistachio nuts. Place these cookies on a prepared cookie baking tray, nut side up. Bake them in the preheated oven for about 10 - 12 minutes, until they just start to turn brown at the edges. Remove from the oven and let them cool down completely. The cookies will be soft when warm, so they must be cooled down before being moved. Dust them with some icing sugar / confectioner's sugar (optional). This recipe makes 23 - 26 cookies, and you can keep them in an airtight container for a few days. 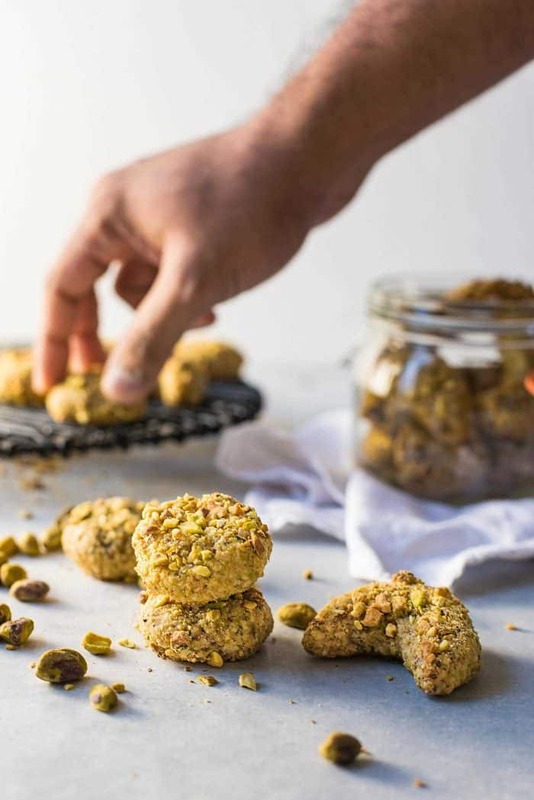 If you liked this quick and easy Italian pistachio cookies recipe, don’t forget to subscribe for new (and free) recipes and updates by entering your email address below (and get all these recipes delivered straight to your inbox)! Hi! Wondering if you have ever frozen these? I haven’t frozen these so I don’t know how well these would freeze. They should be ok, but I can’t be 100% sure. Hi I have tried your recipe and the taste turns out great. I have one question about the texture of the cookies. It’s chewy when bite it. The surface of the cookies is chewy too. Isn’t the soft cookies suppose to be chewy in the middle and crispy skin? 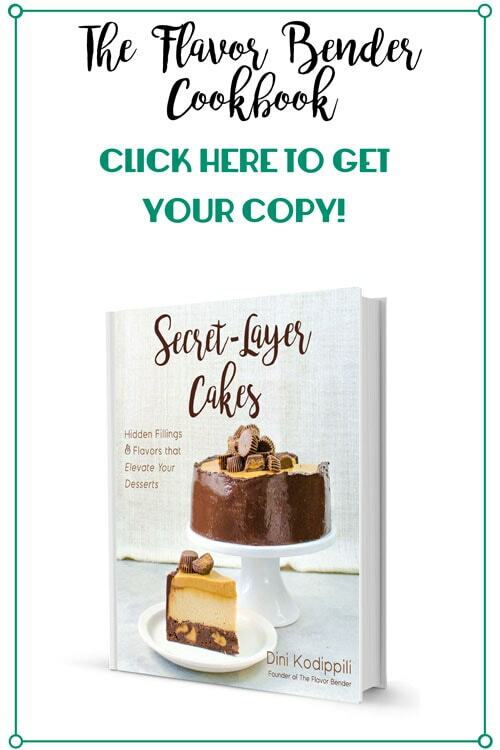 Dini, Thank You for sharing this recipe! My husband & I visited Rome, Italy in 2015 & every day I bought an Italian Pistachio Cookie at this quaint little bakery near our hotel. When we came home, I was so craving them & tried to find a recipe. I just found your site & used your recipe & it is PERFECT ! I am sipping on coffee & enjoying this delicious Pistachio cookie & reminiscing about my beautiful time in Italy. Thank you so much ! Made these and loved everything about them! Easy to make, few simple ingredients, small in size takes out the guilt factor and they contain just the right amount of sweetness! I cannot have dairy at this time, so finding dessert recipes that taste good is a challenge! Thank you! So after having made a pistachio blanc manger I looked at the ground up pistachios and thought surely I can turn these into something as I cringe at waste. A simple google search later and I found your recipe. Full confession I had to take liberties with your recipe to make them because my goal was to use up the pistachios, not run to the store for other ingredients! So without question I will make these per your recipe but figured I might as well post my version too as they came out great. I did not have almonds, only amandes en poudre (I live in France so a staple here) but in short, that’s just ground almonds so figured it would work. I also didn’t have enough pistachios for rolling them in so I rolled them in the amandes en poudre. (It worked great but yours are much prettier rolled in the pistachios and almonds). I also added a micro-plane of lemon zest to the mix. But otherwise the base of the recipe was the same and they may just be my new favorite cookie. My husband and I just had our afternoon espresso and these were the perfect accompaniment. Thanks for sharing your wonderful memory and for traveling down the road of recreating them! How gorgeous! I’m glad I came over to visit! Hi Sam! Thank you so much for visiting my blog. You can definitely substitute all pistachios instead of Almonds if you prefer (and recommended over other substitutions), it will definitely have a stronger pistachio flavour. You could also use ground hazelnuts as well, but that will add the hazelnut flavour. I love these pistachio cookies. And they are Passover-friendly and gluten-free – a triple threat for those of us observing Passover. 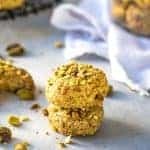 Mmmmm I love all things pistachio and these cookies sound amazing! Pinning and saving the recipe! I do that more often than I care to admit! 😀 It works though!! 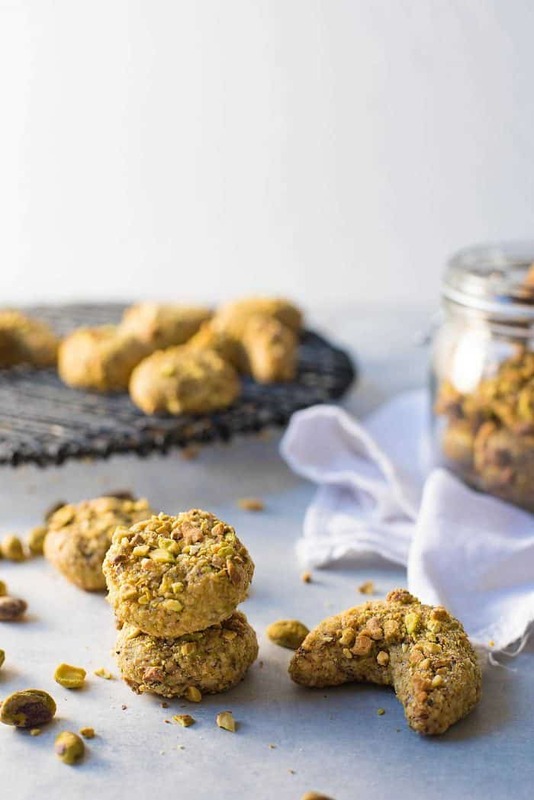 I love pistachios and these cookies look amazing! I LOVE pistachios! When we were kids my parents used to buy us a treat once a week with the food shop, normally we picked something chocolatey but every now and then I’d get a bag of pistachios – that’s how much I love them, 10 year old me sometimes chose nuts over chocolate! I definitely need to make these cookies asap! Thank you Kaila! 🙂 Have a wonderful weekend too! Ooh, I could easily eat a few of these! I wasn’t a fan of pistachio as a child – I think it was pistachio ice cream put me off, but similarly love them now. And love that these are so easy! Will have to give them a try…Thanks for sharing, and happy FF! Oooooooh!!! I love pistachios and anything pistachio flavored… so these are a must try for me 😀 Hearing your stories about the recipe made me smile. Thank you for linking up to Friday Favorites 😀 Enjoy your weekend! Yum! I want these NOW!!! I love pistachios, and these look wonderful! I love recipes like this that only call for a couple ingredients, and how lucky is it that I already have all of them?! Can’t wait to try them! Hi, these sound great. How many eggs do you need for the egg whites? Hi there I’m a lover of nuts and this calls for the perfect recipe !!! I was just wondering if you just add the egg whites in or you wisk them into the ground nuts ?